I must confess that although it has occasionally been fraught with deep disappointment (of course not with my current boyfriend Brian), Valentine's Day has always been one of my favorite holidays. 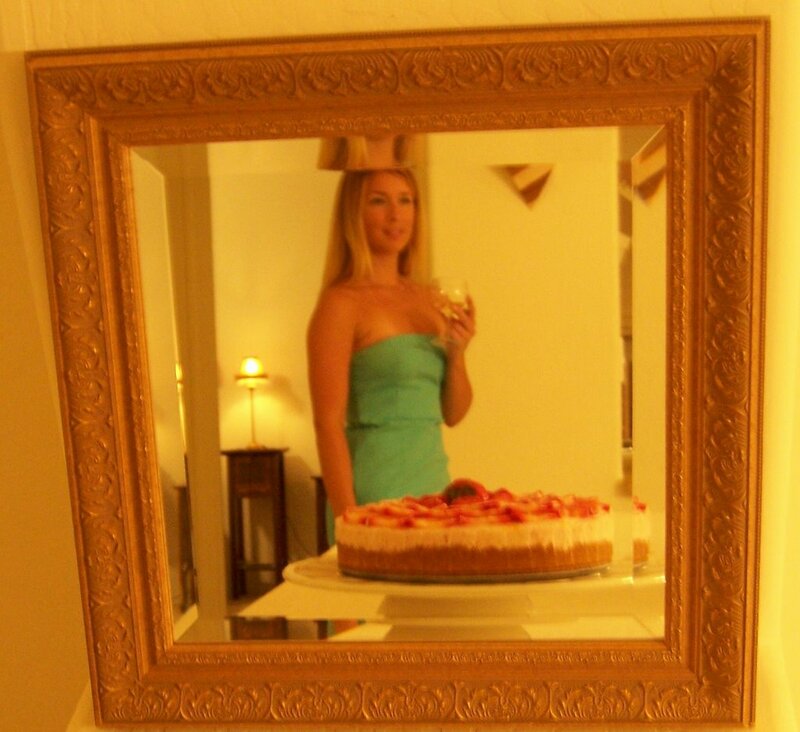 Dressing up in red or pink, small gifts and surprises from friends and the chance to eat a lot of sweets. This year, in celebration, I made white cupcakes with pink vanilla butter cream icing for every co-worker and I am wearing a red sweater. 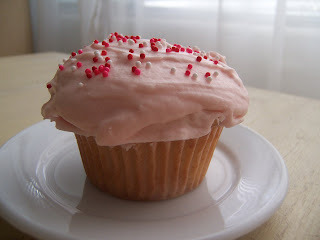 This recipe is from Epicurious and is credited to Hey There Cupcake! 35 Yummy Fun Cupcake Recipes for All Occasions by Clare Crespo. Being a non-baker, I followed this recipe to the letter and it was a huge success with fluffy moist cakes and gooey rich icing. Preheat oven to 350 degrees. Sift the flour, baking powder, and salt together in a medium bowl. In a separate, larger bowl, cream the butter. Gradually add the sugar, creaming until light and fluffy. Add the eggs one at a time, and beat after each addition. In a small bowl, combine the milk and vanilla. To the butter mixture, add about one quarter of the flour mixture and mix well. Add about one quarter of the milk mixture and mix well. Continue alternating the flour mixture and milk mixture, beating after each addition until smooth. Pour the batter into the cupcake tins. Bake for 15 to 20 minutes, until the cake springs back when touched. Well, we are the complete opposite on this holiday! But I do love your cupcakes. I was thinking of you when carefully measuring ingredients for the cupcakes and being careful to NOT deviate. Kirsten, this cupcake is so adorable!! 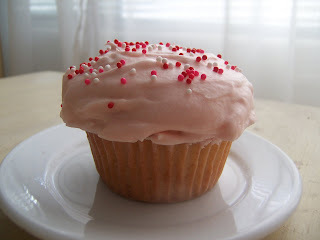 I love the pink icing! I have that book and the cupcakes she presents are beautiful and some are unusual (in a good way) - I have never tried any of the recipes, now I'm inspired by you! I hope you got some sprinkles for Valentine's Day! Sounds like Brian has found himself one smart cookie, er, cupcake. Happy Valentine's Day, Kirsten. Cupcakes have become the next gourmet thing these days, and yours certainly hold their own with the pros. Patricia - you have that cookbook? You MUST try a recipe - it went very smoothly and I'm not really a baker, so I am betting a lot of the recipes are great. Thanks Sandi & Terry for your comments. I did have a nice valentine's day! I am going to have to try this recipe! Your picture makes it all too tempting! If the powdered sugar is for a recipe that is being baked, the measuring would need to be more precise, but with frosting, you are trying to get a good consistency, so it matters less. You can always add more milk if its too dry, and add more powdered sugar if its too wet, so just pack it in there however you like, just make sure you have extra milk and powedered sugar to adjust quantities as needed. Oh my, those truly ARE divine, thanks for your help, Kirsten! I just made them and they are so light and fluffy and moist and the frosting is great, too. My first frosting success! I love baking when it turns out great!